The Petzval lens (or Petzval portrait lens) is the oldest notable lens design for photography. It was calculated and designed by the native Slovakian mathematician and physicist Jozef Maximilián Petzval, and first used for Voigtländer's early metal camera "Daguerreotyp-Apparat zum Portraitiren" in 1841. It was the first camera lens made on the basis of scientific calculation, and was the fastest lens of its time, with an aperture of around f/3.5 - compared to the f/16 or more of typical contemporary camera lenses. 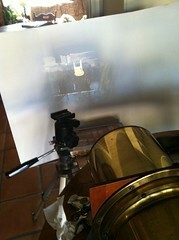 This could reduce the average Daguerreotype exposure time from around 10 minutes to 30 seconds. The design has two separate doublet elements; the front one cemented and the rear one (in the original design) with an air gap (as shown in the illustration). 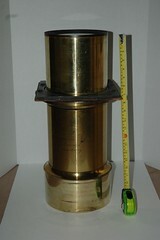 An aperture stop is placed between the two doublets. The lens gave sharp definition in the centre, but covered only a small field for its focal length, and tended to vignette. 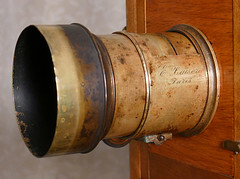 These features were quite acceptable for portraiture, and lenses based on the Petzval design remained in use for studio portraiture for many years. Field curvature of Petzval lens diminishes as lens is focused closer. Since most of 19th century cameras would be considered large format cameras today, the magnification for same object size (e.g. waist level portrait, face) was proportionally greater and therefore curvature smaller than for infinity focus. Such effect is not directly reproducible with same lens design on smaller format cameras. Secondary chromatism of Petzval lens is reduced compared because the first group operates at slower f-number than the entire lens. Petzval lens by E. Baiser of Paris. 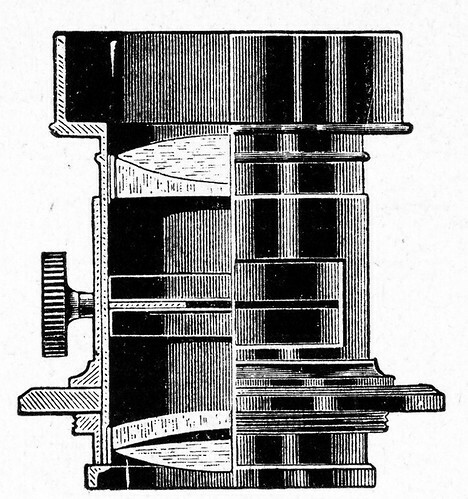 A simplified design had significant use as projection lenses for film. It had second doublet cemented and its positive component placed anterior. ↑ Greenleaf, Allen R. (1950) Photographic Optics. Macmillan, New York. pp67-8. ↑ The Ross Catalogue of 1912 (p 15), seventy years after Petzval's invention, states "For Studio purposes the lenses employed have, until recently, been almost exclusively of the Petzval type. These excellent lenses give central sharpness for Busts and Single Figures, but for Groups and Pictures requiring more extensive covering our "Homocentrics" are now largely used, possessing as they do a defination (sic) more perfect both at centre and margin than any other Anastigmats." The Petzval lens is discussed in Der Österreichische Beitrag zur Fotografie (archived)(the Austrian contribution to photography), chapter 8 of Historische Verfahren in der Fotografie (archived) (Historical methods in photography) by Christian Sporn, a candidate for an award by the Österreichische Physikalische Gesellschaft in 1999; hosted by the Verein zur Förderung des physikalischen und chemischen Unterrichts (Association for the Promotion of Physical and Chemical Education) at the University of Vienna. 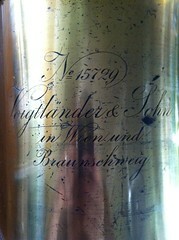 35 cm Voigtländer Petzval lens, about 1863, sold at the 23rd Westlicht Photographica Auction, on 25 May 2013. This page was last edited on 9 April 2018, at 14:37.